A sword is a symbol of power. It is a weapon for attacking or defending. With the right person, it ensures justice and order. With the wrong ones, we expect chaos and disorder. It is one object I associate myself. 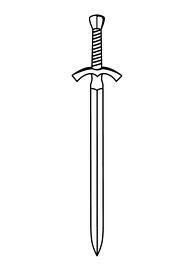 A sword is formed by forging and tempering steel, under extreme heating, cooling and reheating. It is crafted from thousand of hammer blows and beating to achieve desired properties, finished by a well crafted handle and fine sharpening. “How long you need to, say hammer the sword?” says a curious man. “There is no direct formula. It depends on how you feel you need to hammer it. After several hundred of blows, you can have a feel of the unfinished sword. You will know by heart if that thing can still take it or no more. To attain its maximum strength, the process must be exacted at verge of breaking. Anything more will make the sword break, hence useless.” said the blacksmith. There is only one difference from that fact – that I am unbreakable. My malleable limits are infinite. Not even the infinite or infinitesimal attempt to break me will prosper. I do not lose my characteristics upon life’s beating. I collect them and make them part of my indestructible form. Of course it can only apply to my mind and spirit. The flesh does not always agree. The sword is my personality. My handle is for those who are learned of the art. I am free to use. But be reminded that I am no one’s master nor I choose any one. I am the master of myself. I have all the geniuses you can think and need from a sword. I am a tool, but I am not a slave. The unique duality of a sword is my very nature: for justice or impunity, offense or defense, to live or to die. Tested by fire, hammered by ridicule under the anvil of isolation. As a sword made for human use, I am, built to tear flesh. But not yet. I am just a sword waiting to be done – a sword asking for more beating. It all started with a recitation in Criminal Law 2 subject. That morning, the topic being discussed is about Direct Assault, under Article 148 of the Revised Penal Code (Act No. 3815). Article 148. Direct assaults. – Any person or persons who, without a public uprising, shall employ force or intimidation for the attainment of any of the purpose enumerated in defining the crimes of rebellion and sedition, or shall attack, employ force, or seriously intimidate or resist any person in authority or any of his agents, while engaged in the performance of official duties, or on occasion of such performance, shall suffer the penalty of prision correccional in its medium and maximum periods and a fine not exceeding P1,000 pesos, when the assault is committed with a weapon or when the offender is a public officer or employee, or when the offender lays hands upon a person in authority. If none of these circumstances be present, the penalty of prision correccional in its minimum period and a fine not exceeding P500 pesos shall be imposed. There are actually two ways of committing Direct Assault based on the above provision. First, by any person or persons who, without a public uprising, shall employ force or intimidation for the attainment of any of the purposes enumerated in defining the crimes of rebellion and sedition. Second, by any person or persons who, without a public uprising, shall attack, employ force, or seriously intimidate or resist any person in authority or any of his agents, while engaged in the performance of official duties, or on occasion of such performance. Suppose we have this scenario where two judges, both persons in authority, agreed to fight each other in a public place, can there be Direct Assault? My answer, based on 2-second interval of thinking is NO. There can be NO DIRECT ASSAULT. According to the professor, my answer is wrong. I was stunned. How can I be wrong? When does the act of consenting each other to fight (and commit felony) which resulted to injuries can (still) be a valid cause of action? That at the time of the assault the person in authority or his agent (a) is engaged in the actual performance of official duties, or [b] that he is assaulted by reason of the past performance of official duties. 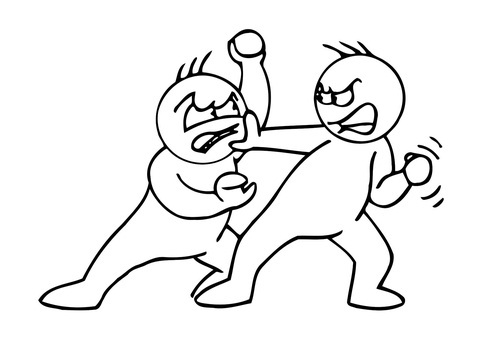 That the offender knows that the one he is assaulting is a person in authority or his agent in the exercise of his duties. Take the hypothetical question (which according to the professor was based on actual events) in analysis. All the five (5) elements may be well satisfied. Unfortunately, I could not find a jurisprudence to seal the issue. After a web search, I found a somewhat similar instance in the same place as claimed by our law professor. In Caoibes Jr. vs. Hon. Ombudsman (G.R. No. 132177. July 19, 2001), the facts were closely related. In this case, Judge Caoibes boxed a fellow Judge Alumbres within the hallways of their chambers. A criminal case was brought by Judge Alumbres to the Ombudsman for physical injuries, malicious mischief for the destruction of eyeglasses and assault upon person in authority. Another complaint (administrative) was filed with the Supreme Court praying for the dismissal of Judge Caoibes from the judiciary on the ground of grave misconduct or conduct unbecoming a judicial officer. The Supreme Court held and directed the Ombudsman to dismiss the complaint filed with them and refer the same to them for appropriate action. The Court later decided the case under A.M. No. RTJ-99-1431 dated January 23, 2002, which held Judge Caoibes “guilty of violating the Code of Judicial Conduct and hereby impose upon him a fine of TWENTY THOUSAND PESOS (P20,000.00), with a warning that a repetition of the same or similar acts in the future will be dealt with more severely.” (What happened to the criminal offense?) Take note that this was an administrative and not a criminal proceeding. In the case of Gelig vs. People (G.R. No. 173150. July 28, 2010), the Court had the occasion in demonstrating a more discreet scenario of its application. Two public school teachers falling under the definition of “persons in authority under Art.152 of the Revised Penal Code were involved, one Lydia Gelig and the other Gemma Micarsos. The RTC decided the case convicting Lydia with complex crime of “Direct Assault with Unintentional Abortion”. The Court of Appeals vacated the trial court ruling with Slight Physical Injuries. It ruled that Lydia cannot be held liable for direct assault since Gemma descended from being a person in authority to a private individual when, instead of pacifying Lydia or informing the principal of the matter, she engaged in a fight with Lydia. Likewise, Lydia’s purpose was not to defy the authorities but to confront Gemma on the alleged name-calling of her son. WHEREFORE, the Decision of the Court of Appeals finding petitioner Lydia Gelig guilty beyond reasonable doubt of the crime of slight physical injuries is REVERSED and SET ASIDE. Judgment is hereby rendered finding Lydia Gelig guilty beyond reasonable doubt of the crime of direct assault and is ordered to suffer an indeterminate prison term of one (1) year and one (1) day to three (3) years, six (6) months and twenty-one (21) days of prision correccional. She is also ordered to pay a fine of P1,000.00. SO ORDERED. The applicability of pari delicto is still disputable above. In the ruling, the Supreme Court relied on the theory that Gemma is of no fault, hence pari delicto is not present. So, can Direct Assault really apply to a pure case of “equal fault”? It appears that the pronouncements are self-explanatory and conclusive(?). I will have to seal the answer to the question with the issue. It is admitted and accepted, until then again. Petitioner opened with respondent a domestic letter of credit (LOC) in favor of Ekman and Company, Inc. (Ekman) for the purchase of five hydraulic loaders. The first three hydraulic loaders were received by the petitioner before the expiry of LOC and respondent paid Ekman. The remaining two hydraulic loaders were received by the petitioner after the expiry of LOC/contract but respondent still paid Ekman. Petitioner refused to pay respondent. Respondent filed a case. Petitioner answered by way of affirmative defense that respondent had no cause of action being allegedly in bad faith and breach of contract. The trial court and Court of Appeals ruled in favor of respondent to recover from the cost of two hydraulic loaders. Whether or not the respondent is entitled of reimbursement from petitioner for its payment out of mutual negligence. YES. Petitioner should pay respondent bank the amount the latter expended for the equipment belatedly delivered by Ekman and voluntarily received and kept by petitioner. Respondent bank’s right to seek recovery from petitioner is anchored, not upon the inefficacious Letter of Credit, but on Article 2142 of the Civil Code which reads: “Certain lawful, voluntary and unilateral acts give rise to the juridical relation of quasi-contract to the end that no one shall be unjustly enriched or benefited at the expense of another.” When both parties to a transaction are mutually negligent in the performance of their obligations, the fault of one cancels the negligence of the other and, as in this case, their rights and obligations may be determined equitably under the law proscribing unjust enrichment. Guillermo Uy assigned to respondent his receivables due from Pantranco North Express Inc. (PNEI). Respondent filed a collection suit with an application for issuance of preliminary attachment against PNEI which was granted by the RTC. The sheriff issued a notice of garnishment addressed to PNB and PNB MADECOR. The RTC rendered judgment against PNEI with writ of execution causing the sheriff to garnish the amount therein from the credits and collectibles of PNEI from petitioner and levy upon the assets of petitioner should its personal assets be insufficient to cover its debt with PNEI. Petitioner claimed that as debtor, it is likewise a creditor for PNEI considering unpaid rentals of PNEI for its parcel of land and by operation of law on compensation, it is actually the PNEI that still has outstanding obligations to it. Whether or not there was legal compensation between the petitioner and PNEI as a defense of the former. NO. There could not be any compensation between PNEI’s receivables from PNB MADECOR and the latter’s obligation to the former because PNB MADECOR’s supposed debt to PNEI is the subject of attachment proceedings initiated by a third party, herein respondent Gerardo Uy. This is a controversy that would prevent legal compensation from taking place, per the requirements set forth in Article 1279 of the Civil Code. Moreover, it was not clear whether, at the time compensation was supposed to have taken place, the rentals being claimed by petitioner were indeed still unpaid. Petitioner did not present evidence in this regard, apart from a statement of account.